Representatives of the Liberation Tigers of Tamil Eelam (LTTE) and Jemiyathummal Ulama Council (JUC) in Kinniya Sunday at a discussion held at the office of the Sri Lanka Monitoring Mission (SLMM) in Trincomalee agreed to identify elements who are working to derail the peace process and not to relentlessly work together to identify such elements. Both parties further agreed to have continuous dialogue to resolve differences that may arise in future, sources said. 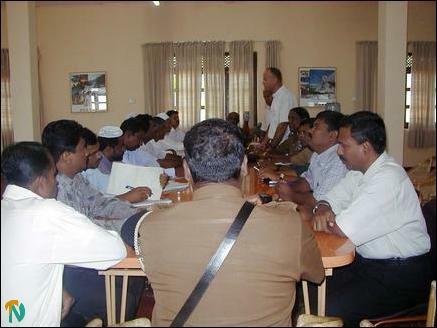 The SLMM head in Trincomalee district Mr.Abdel Burkan facilitated the discussion between the representatives of the LTTE and Kinniya Muslim religious leaders to resolve problems of last week, which resulted in the imposition of night curfew for two days to bring down the tension, sources said. 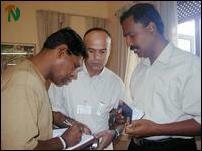 The LTTE delegation was led by its district political head Mr.Thilak and inclluded TEEDOR Trincomalee head Mr.S.Tharman. Moulavi U.Y.Hathiathullah led the Kinniya Jemiyathummal Ulama delegation. Trincomalee district General Officer of Commanding Major General Sunil Tennekon, Senior Superintendent of Police Mr. Upali Hewage, Superintendent of Police Mr.Daya Samaraweera and several police officials attended the conference. SLMM Trincomalee head Mr.Abdel Burkan made the opening address inviting both parties to discuss their problems and to find solutions through dialogue, sources said. At the end of about two hour talks, representatives of LTTE and Kinniya Jemiathulamal Ulama Council jointly told media persons said that they have agreed to identify elements who are responsible for creating the present crisis. LTTE Trincomalee district political head Mr.Thilak said that LTTE activists were not involved in any abduction in Kinniya division. Police and SLMM would go to the scene and hold inquiry regarding the matter, according to sources.